On 17/10/2017 MCX COMMODITY OPTION was officiated by our honorable finance minister Arun jaitley. MCX has first started gold option. That is MCX has introduced GOLD OPTION TRADING with 31 strike prices. 1 AT THE MONEY OPTION, 15 IN THE MONEY CALL OPTION and 15 IN THE MONEY PUT OPTION. SEBI gave nod for the products which is making turnover of 1000 cr daily to be traded in commodity option. 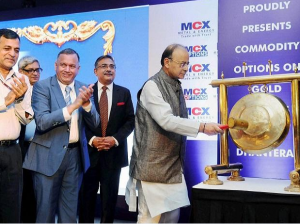 First MCX has introduced gold and it will introduce few more products in coming days. On first day 17/10/2017 gold option gets good response. That is the volume is higher on first day. As premium is more on first day small trader’s cant able to trade (AT THE MONEY OPTION). As expiry day comes nearer the premium will be low and the volume will be higher. As the traders in commodity market trades in future they might not know more about option trading. It will take some time to know about option and in four or five months from now on hope the volume will be getting higher in MCX COMMODITY OPTION. In next post we can see the EXPIRY CLOSING STRATEGY in GOLD OPTION TRADING.